Let Children Be Children— With Emaan! 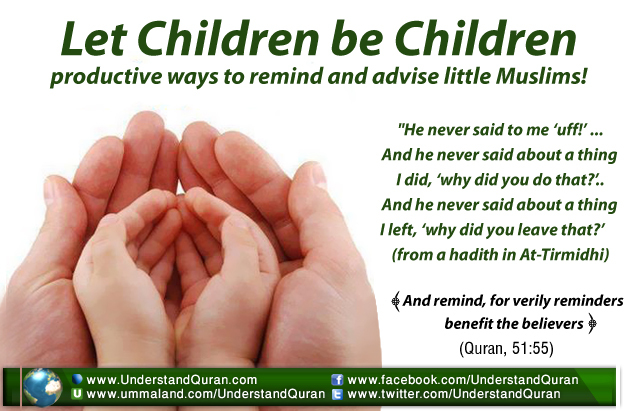 Understand Al-Qur'an Academy > Articles > Let Children Be Children— With Emaan! Children are a test from Allah ‘azza wajal. Dealing with them in the right way can bring lasting rewards, and treating them wrongly can have a bad effect on your life and your hereafter. Bottom line: kids have a profound effect on your productivity! Nobody likes to be forced into anything, especially not children! This week you’ll discover practical, productive ways to remind and advise little believers from the Quran and the Seerah. Let children be children and find out how to get your message across and nurture emaan in little souls. Even though many people think tarbiyah means educating and teaching, it really means cultivating, growth and nurturing. Children have a fitrah (natural disposition) and it is our role to assist them to grow and build their emaan. Here are seven tricks on how to give children naseehah— advice— the productive way! 1. Change your explanation while keeping your cool. Repetition is a very important way of getting a message across; Allah ‘azza wajal gives us many reminders in the Quran, like stories about the different nations, prophets, Paradise and Hellfire. The Prophet salallahu alayhi wa sallam would repeat his advice three times. When it comes to children the way of repetiion is key. Do you find yourself getting tired of repeating yourself with no result? Your child heard you the first time and by repeating yourself in the same way, you are simply training her to stop listening and wait for you to get frustrated. 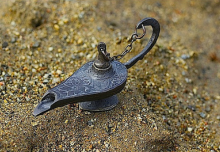 Action points: Balance changing your explanation while keeping your cool. There’s a beautiful example in a father whose child was drawing on the neighbors’ gate. He became angry, rebuked the child, and ordered the child to clean it. His friend then asked him if he ever sat with his child and told him about the great rights Islam granted a neighbor! He never said to me ‘uff!’ (an Arabic word used to express annoyance). Do you catch yourself saying “Don’t do that!” or “Stop that!” all the time? 3. Let them be in charge. You’ll get a lot more cooperation this way. A beautiful example is how the Prophet salallahu ‘alayhi wa sallam put Usaamah ibn Zayd in charge of an army when he was only eighteen; he nurtured his skills and gave him responsibility at a young age! Action points: Put one child in charge of getting everyone ready and see how quickly it will happen! Let your child prove how capable she is. And he never said about a thing I did, ‘why did you do that?’ If your child did something wrong, of course you have to address it. Your child most likely doesn’t even know what to answer when you’re shouting “why did you do that?” in the heat of the moment, simply because they can’t analyze their own behavior. When confronted with “why?” a lot of kids will shut down or get defensive. Action points: Try guessing what your child might have felt and what her underlying needs are. “Did you feel angry because your sister didn’t listen to you?” She might have bitten her sibling because she needed space and was scared and didn’t know how to communicate it! 5. Be gentle with their feelings. This way you’ll train them to stuff their emotions and in turn become young people who have angry outbursts. Be respectful and don’t try to convince your child their desires don’t matter. 6. If you do this, I’ll give you . . . 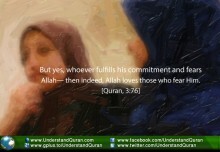 Constantly bribing children makes them not want to cooperate simply for the sake of Allah. Teach your children that doing certain things makes Allah happy and will give them super-special gifts – hasanaat. Action points: Offer genuine gratitude and instead of saying, “if you clean up, I will give you a sweet,” say “Thank-you so much for helping me clean up!” or remind them of times they were helpful, by saying “Remember a few weeks ago when you helped me tidy the whole room? That was such a big help. Jazaakallahu khayr!” Then let your child come to the conclusion helping out is something rewarding in itself. 7. Show them their effort counts. Focus on your child’s effort rather than on the result, and teach them that their effort is more important than the result and that their success comes from Allah alone. This teaches children to be more persistent when they are trying a difficult task and to have more sabr– patience— when something does not work out. Rabanna hab lanaa min ’azwaajinaa wadhurriyaatinaa qurrata’a`yuniw-waj`alnaa lil-muttaqeena imaama. May Allah ‘azza wajal guide us to be productive and just parents, ameen! THE AYAH JOURNAL is dedicated to inspiring you to open the Qur’an every day, pick one ayah, and apply it to your own life by making acting on that ayah your mission for the day. Let’s bring back the message of the Qur’an to our daily lives! Check www.ayahjournal.com. And the Answer is . . . Al-Ghafoor! And the Answer is . . . Al-Haqq! umme zaib November 12, 2013	Log in to reply. SubhanAllah! You are doing a great job..
May Allah swt help you through out your journey. Razia Mughal November 21, 2013	Log in to reply. aslaamualaikum and Jazakallah Khair May Allah SWT reward you that was such a beutiful article as a parent i tend to get frustrated to often, maybe cause i dont know how to bahave towards children misbehaving and also we were totally brought up in a different way. Subhaannallh Islam is such abeatiful religion I am learnig so much and definatly in a positive way after learning more about my religion. Alhumdulillah I am so blessed to be a Muslim I never really realised until I started to read and learn. Our Lord! let not our hearts deviate after you have guided us, and grant us mercy from you. Truly, You are the Bestower.